The event Moldova 650 was celebrated by the National Bank of Moldavia through the issue of a special anniversary set comprised by 4 values (church of Căuşeni, Codex of Vasile Lupu, Moldavian chronicles and Moldavia 650). The logo of the celebrations is an allegory bearing as central element the simplified image of Soroca Fortress seen from across River Nistru, the only medieval Moldavian fortress kept under effective control of the Republic of Moldova. 650 years are celebrated in 2009 since the establishment of the independent principality of Moldavia, in 1359, under the scepter of Bogdan I the Founder (1359 - 1365) - Romanian voivod come from Maramureş (northern region of Transylvania), event known also as the second dismounting of Moldavia (meaning settling). This event, logically succeding the first dismounting of Moldavia, in 1353, under voivod Dragoş, also from Maramureş, is one of the most important events in the history of the Romanians. Once obtained the independence from the Hungarian Kingdom, the political merger of the Romanians between the Carpathian Mountains, River Nistru and the Sea came to pass swiftly, in less than 30 years in the opinion of historian Giurescu. King Louis I of Hungary engaged several military incursions in Moldavia, between 1359 and 1365, against the notoriusly disloyal Bogdan, all without success. The domains in Maramureş of Bogdan are gifted to Balc, heir of Sas and as such grandson of Dragoş - who had stayed loyal to Louis and as such banished from Moldavia, through a Hungarian deed preserved until today, that stresses conclusively the birth of independent Moldavia. "We [...] give him a fief named Cuhea, in our country of Maramureş with the villages Ieud, Bascov, the two Vişău, Moiseni, Borşa [...], with all their pertainings, namely waters, forests and mountains and whatever belongs to them, fief that we have taken from Bogdan voivod and his sons, our notorious disloyal. As Bogdan and his sons, through the work of the devil, foe of the mankind, straying from the faith they owed us, passed covertly from our Hungarian kingdom into our named country of Moldavia and strove to keep it, to the offence of Our Majesty." Namely this donation act to Balc, from 1365, is considered by Giurescu as a recognition by Hungary of the impossible return of Moldavia under suzerainty: "In this moment, the second independent Romanian state was [already] established, as a very important event in the history of our people." The National Bank of Romania did not yet mark this jubilee through coin striking in 2009. We strongly consider that this "very important event in the history of our [Romanian] people" must be marked as such also the NBR, a thing that will not let us wait for long now. 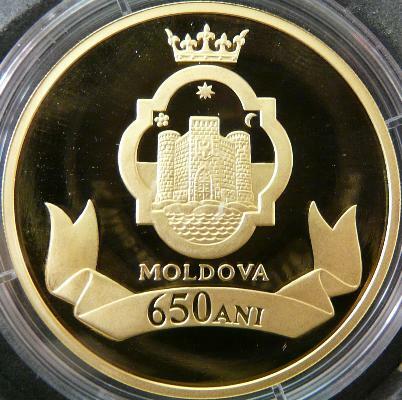 It would be absolutely inexplicable should the 650 years passed since the establishment of independent Moldavia not be properly celebrated, as in 2008 it stayed unexplained the absence of numismatic issues dedicated to the sexacentenary of the first documentary attestation of the city of Iaşi, one of the chief cities of Romania and capital of Moldavia - a city without the mentioning of which the history, culture and life of the Romanians in all provinces cannot be told over the last half millennium. The immortalization of the moment and of the effigy of Bogdan I on Romanian coins struck by the NBR would complete merrily the immortalization, also in 2009, of the effigy of prince Nicolae Alexandru on coins, descender of Basarab I the Founder, likewise a great voivod from the beginnings of Romanian statehood, issue occasioned by the celebration of again 650 years, this time passed since the establishment of the Metropolitan Church of Walachia. 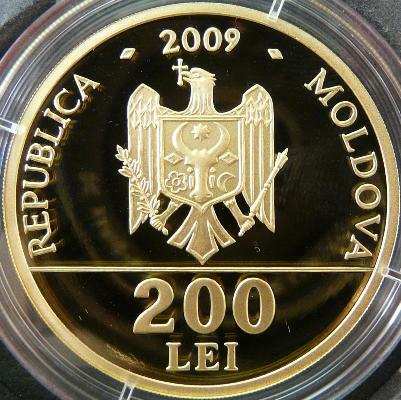 The fortress of Soroca is also represented on the 100 lei of 2007 coin issued by the Republic of Moldavia and dedicated to prince Peter Rareş. Pe pagina acestei monede puteţi vedea imagini cu cetatea. The Fortress of Soroca is represented on a commemorative silver coin of 100 rubles 2007 issued by Transnistria (self proclaimed state on the eastern strip of the Republic of Moldavia) as member of series Old Fortresses on Nistru.